The stadium is dominated by the large South Stand at one end. Almost twice the height of the other stands, it is two tiered with a row of executive boxes running across the middle. Opposite, the Davie Cooper Stand, is a small covered seated stand. 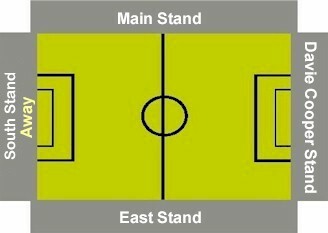 The single tiered Main Stand on one side of the ground, is both raised above pitch level and set back from it. This older stand has windshields to either side as well as a few supporting pillars. It is unusual in that the stand itself doesn't run the full length of the pitch, but the supporting steelwork does, making for an odd looking sight. According to Simon Inglis in his book 'The Football Grounds Of Great Britain', this was because it was originally intended in 1962 to build a full length stand but due to a dispute with a an owner of a house beyond the corner of that ground (a dispute which the club lost) it was never completed as intended. This stand was funded chiefly from the sale at that time of Ian St John & Pat Quinn to Liverpool. This did not go down well with the fans as many subsequently boycotted the stand and to this day it is the most sparsely populated section of the ground. Opposite is the smaller East Stand, which also has a number of supporting pillars, running across it. Craig Barry recommends the 'Jack Daniels Bar, which is the closest to the ground. It is popular with both home and away fans, each having their own bar'. 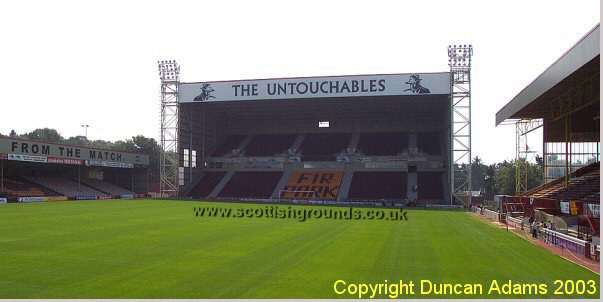 Whilst Craig Irving adds; 'The Fir Park Social Club is on same road as the ground and is an extremely friendly boozer. Away fans are normally admitted, although restrictions may be put in place for Old Firm games'. Leave the M74 at Junction 6 and head towards Motherwell. At the first set of lights that you come to turn right onto the B754 (Airbles Road) towards Wishaw. The ground is at the end of this road on the right. Street parking. Concessions apply to over 60's and full time students. Juveniles are classed as under 16's. For the Motherwell fixture list click here (to take you to the BBC Sports Website). 35,632 v Glasgow Rangers, 1952. If you require hotel accommodation in the area then first try a hotel booking service provided by Football Hotels who are powered by Activehotels, who specialise in locating accommodation near or within a short travelling distance of the football ground. They also have the added advantage over some other hotel booking services that you pay on departure. Yes this site will earn a small commission if you book through them, but it will go to help with the running costs of keeping the Guide going. To access their Motherwell and Glasgow page click here. Copyright � Duncan Adams 2009. All rights reserved.